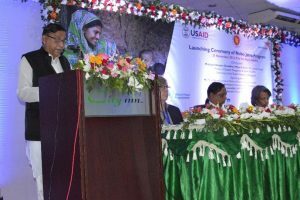 KHULNA, November 30, 2016 —The formal launch of the five year U.S. Agency for International Development (USAID) Food Assistance Program ‘Nobo Jatra’ took place in Khulna on 30th November 2016. The overall program goal is to ‘improve gender equitable food security, nutrition and resilience of vulnerable people within Khulna and Satkhira districts in Bangladesh’. Implementation is in the south west coastal areas of Bangladesh, also identified as a Feed the Future Zone of Influence, across four geographically contiguous Upazilas (sub districts) under two districts; Dacope and Koyra in Khulna; Shyamnagar and Kaliganj in Shatkhira covering 856,116 direct beneficiaries. The Honorable Minister, Mofazzal Hossain Chowdhury Maya, Birbikram, M.P., Minister of Disaster Management and Relief, Government of Bangladesh, the U.S. 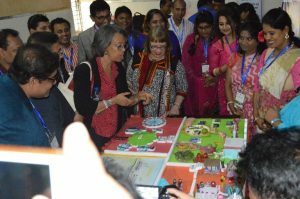 Ambassador to Bangladesh Marcia Bernicat, and the USAID Bangladesh Mission Director Janina Jaruzelski, were present at the event as special guests. The event was also attended by eminent members of the Government of Bangladesh as well as development partners and practitioners, international and local NGOs, implementing consortium partners, national and local media, leading academia as well as other influential stakeholders. Led by World Vision Bangladesh (WVB), the USAID Nobo Jatra program is a shared commitment with World Food Programme (WFP) and Winrock International (WI) as sub grantees and is implemented in partnership with the Ministry of Disaster Management and Relief (MoDMR) of the Government of Bangladesh. The vulnerability of local communities in the south west coastal areas of Bangladesh are exacerbated by the current trajectory of climate change, with a projected increase in severity and frequency of climatic events . Increased soil erosion and salinity levels as well as ground water contamination have adversely contributed to the overall food security levels of the population. Given this backdrop, Nobo Jatra will work closely with government, consortium partners and local NGO’s to reach families living under the poverty line to improve knowledge and capacity on Water, Sanitation and Hygiene and Maternal Child Health and Nutrition, increase agricultural activity and generate income, address chronic malnutrition and improve resilience to shocks and stresses. These interventions will all be underpinned and informed by gender equality and social accountability, which combined help form the enabling environment for transformative change. During the opening address, World Vision Bangladesh National Director highlighted that the World Vision Bangladesh strategy runs parallel to the Government’s Vision 2021 to transform Bangladesh from a low income to middle income economy. As a flagship program for World Vision Bangladesh, Nobo Jatra further aligns with the broader Government vision to ensure that vulnerable communities have a higher standard of living through sustainable development and better resilience to climate change and disasters. The Honorable Minister, Mofazzal Hossain Chowdhury Maya Birbikram, M.P., Ministry of Disaster Management and Relief lauded the launch of the Nobo Jatra program and the unique collaborative nature of the partnership between the Government of Bangladesh, USAID, World Vision Bangladesh and sub grantees World Food Programme and Winrock International. The Honorable Minister also emphasized the commitment of the Government to the Nobo Jatra program and the goal to bring visible changes to the lives of 856,116 beneficiaries covered through the program working areas.